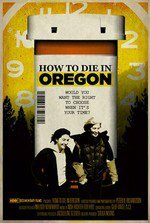 "How to Die in Oregon" is an intimate and personal look at the Death with Dignity laws in Oregon. The documentary primarily follows the final months of Cody Curtis, a 54 year-old cancer patient and mother of two, with her decision regarding her end-of-life planning. Written by main subject, Cody Curtis, on How We Die: "My Story"
NYT review: "Unflinching End-of-Life Moments"
"It seems like a story about dying, but actually it is very much a story about living." I didn't know this doc existed. It's a subject I'm greatly interested in. I'm going to have to figure a way to justify (to the mrs) renting it. Thanks! This documentary does an amazing job of capturing just how extraordinary and vital a woman she was, even to the very end. (Thorzdad, I may be biased because I cried my eyes out when I saw this in the theater after being unable to get out to Portland for Cody's funeral, but this is not a movie I would spring on a unsuspecting spouse, it's a hell of a thing to sit through). Oh, I wouldn't dream of springing it on her. I thought Cody was so, so vibrant and immediately likeable. Her insights and honesty really made the documentary what it was. I probably would have liked a little more insight into dissenting perspectives on the Death with Dignity laws or perhaps a more information on the countries in Europe that have allowed this years before it was a thing in the US. But the questions that Cody brings up on life, living, death, dying-- are already very substantial and satisfying, which is why the film as a whole worked well even without those additional perspectives.